This 6' ft Santa Claus and Polar Bear Light Up Christmas Inflatable By Comin™ makes an eye-catching outdoor lawn decoration. It's simply the perfect combination between simplicity and bold, with the two complementing each other perfectly. Added on is the wear-proof design, which improves the ability to last. Instead of his traditional reindeers, Santa Claus has now opted for a polar bear as a ride instead in this 6 feet Christmas inflatable. What's more, the polar bear is actually animated to move his head from side to side. 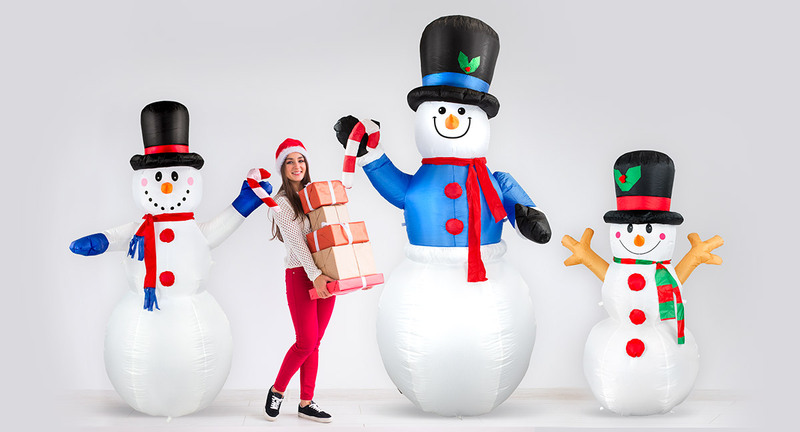 Coupled with Santa's friendly wave, this inflatable is perfect for greeting people passing by on any lawn or porch. With a big bag of presents and a mini Christmas tree, Santa looks more festive than ever. In addition, the high-quality manufacturing of this product means that Santa is going to stick to this new ride for quite a while. My family loves this inflatable! Looks great on our lawn, big plus that it lights up and the polar bear's head turns. Overall very happy with my purchase.